The Gooderham & Worts families emigrated from the Scole / Bungay area of England in the early 1830s, arriving in York, (now Toronto, Canada). First came James Worts, accompanied by his 13 year-old son, James Gooderham Worts. They built the windmill near the mouth of the Don River. They were followed in 1832 by William and Ezekiel Gooderham, their sister, Elizabeth (James Worts' wife) and 54 extended family members. Over the following 75 years, these families created the largest distillery in the world, as well as contributing to milling, banking, railways, shipping, farming and other essential components of the growing industrial country. They were active in the church and in various communities, as well as in health care and even in our political institutions. In 2013, descendants of the Gooderham and Worts families created an online website that includes a family tree with photos, documents and stories. 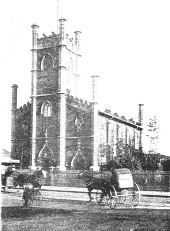 “In Toronto’s Church of England history, St. James Cathedral and Trinity Church are indissolubly united because they are the two oldest parishes in the city -- Trinity building however, is the older, as the cathedral has been destroyed by fire twice. The church is known to many as Little Trinity in order to distinguish it from the larger Trinity Church on Trinity Square, and which came about in this way - an unknown benefactress left money for an endowment, on condition that the church should be called Trinity Church. As there was already a Trinity Church in the city, some perplexity arose as to the matter, so the difficulty was solved by calling the Yonge St. church Holy Trinity and the church of this article is known far and wide as “Little Trinity”. When the church was first erected, like nearly all Anglican churches, it had extensive galleries. These have all been removed and arrangement of the pews altered -- these in the old days were the old fashioned high-backed class, now the seats are low, and afford no chance for an attendant at the service to slumber unawares. The church’s book of christening records goes back to the first to take place within its walls. In faded ink one finds each christening numbered, and the very first is listed with the baby’s names as: Charles Horace, son of William Gooderham, miller, and Harriet Gooderham. The baby’s birth was listed as February 18, 1844 and the christening was held the very same day. One reason for this may be the fact that another christening the same day and listed as number 2 on the record book was that of James Gordon Worts, son of James G. and Sarah Worts. Young James Gordon was born several weeks earlier, however, on December 18, 1843. We ask you to help! If you are a descendant, historian or some other person with relevant information or material, please get in touch. Nothing related to living descendants will be available to the public. In fact, public information will be limited to people who died in the 19th or early 20th centuries.